Help children create routine charts to encourage responsibility. Create routine charts WITH your child. Brainstorm tasks that need to be done. Take pictures of child doing each task. "What is next on your routine chart?" Do not take away from feelings of capability by adding rewards. I have to confess that I have attempted this process of creating routine charts in the past without much success. Most of that is due to my lack of follow through. I can recall when the kids were much younger I took pictures of all their morning routines. We created the routine charts, put them up on their bedroom walls and then completely forgot about them. Next thing I knew...I was back to my usual morning routine of reminding them to do every little task. "Have you brushed your teeth? Did you make a lunch? What about your library book?" Not only was I reminding them to do every little thing, but several times a week I would receive a phone call from the school. "Dad, I forgot my lunch." So let's see how it works this time. 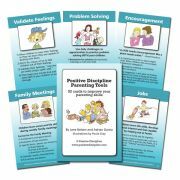 As my children and I sat down to discuss this tool card, the most important step seemed to be the part about brainstorming tasks that need to be done. This really got the kids thinking about what they needed to do every day. They even came up with things I hadn't even thought of. So after the brainstorming I set them free to create their routine charts. I didn't interfere too much in this process. They seemed to be excited about taking ownership for their own routine charts. My daughter has been very interested in typewriters lately, so she decided to type her routine chart. 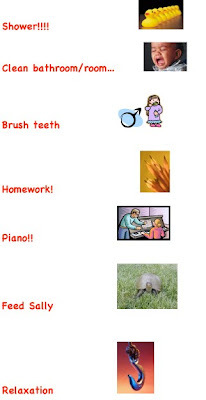 My son opened up Microsoft Word and started creating his routine chart using the Word clip art files. I didn't even know Word had clip art files, so I learned something today. After a few minutes they were both finished and hung their new routine charts on their doors. Now it is time to sit back and see how they follow through. 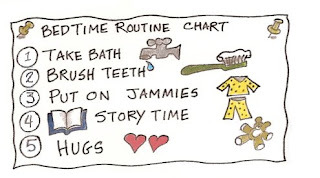 If you would like to share your children's routine chart creations, email a picture to contact@positivediscipline.com. We'll find a way to share them on the blog. I'm impressed with Emma's typing. How does she do it without mistakes??? Another successful day! He did his reading and math work, and did it well! However, our Au Pair does note that he's very hungry when he returns from school, so the two of them brainstormed that he would first eat, then do the math, then have a little play break and then we do the reading work and then nap ....they will try that tomorrow. I will update the posted routine with my son tonight for the fridge. Last year about this time I started a velcro routine chart with my 3 and 1/2 year old. He could already read really well. So I had words down one side and pictures with velcro down the other and everytime he finished one he would put up the matching picture. He loved it and got to the point where he didn't need it anymore. I might need to reinstate it now though. I am nagging too much. Thanks for the blogg.